Using the best down pillows help you sleep better, no matter what position you like to sleep in. They also give you that luxurious feel of sleeping in a fancy hotel each night – without the fancy hotel budget! We found 10 amazing down pillows that work for different sleeping positions, different size beds, and different budgets! Before we get into the best down pillows review, here are a few key features you should be familiar with before you start shopping. Cover Material: The cover material can vary from 100% cotton to Egyptian cotton, polyester, and cotton-poly blends. Cotton and Egyptian cotton are known for staying cool and feeling soft to the touch, whereas polyester is known for being easily washable and durable. Size: Pillows vary in length, so it’s best to choose the right size pillow for you and possibly your existing pillowcases! 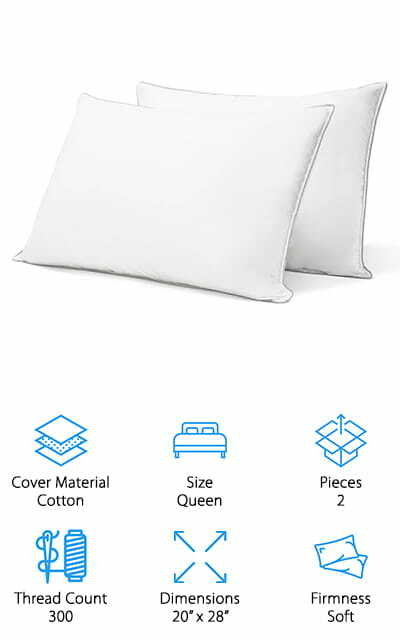 Standard and Queen size pillows typically fit into standard pillowcases, but King size pillows will need longer cases to fit. 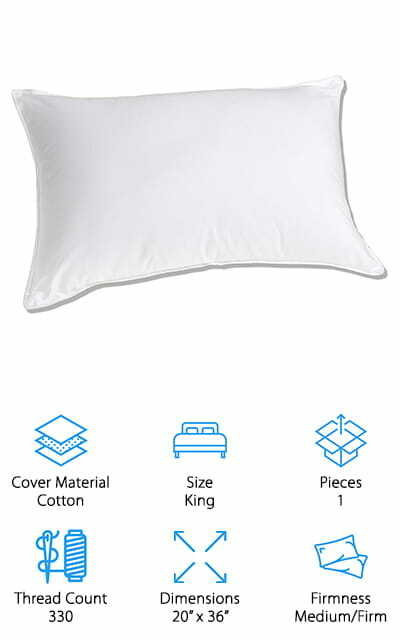 Pieces: When buying pillows online, make sure to note how many pillows come in each order! That way, you can budget for the right number of pillows you’ll need, and you won’t end up with any surprises when your order arrives! 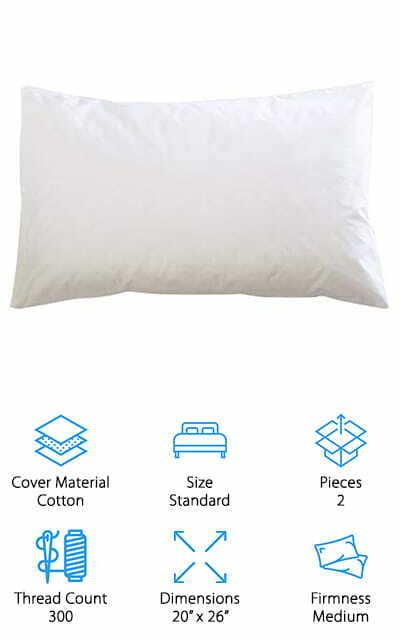 Thread Count: For the cotton pillow covers, we also noted the thread count for each pillow. Lower thread counts are less durable, but great if you’re on a budget. Higher thread counts are durable, silky soft, and are well worth the investment! 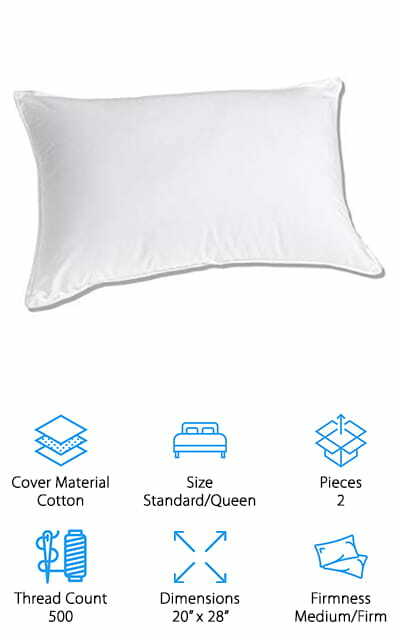 Dimensions: In addition to the traditional Standard/Queen/King sizes, we also let you know the exact dimensions of each pillow. This can be important if you want to use your existing pillowcases or decorative shams, or you just prefer a specific size. Firmness: The pillow firmness you need depends on your personal taste and how you sleep. For side sleepers, medium and firm pillows are best to support the head and neck. For stomach and back sleepers, softer pillows may be more comfortable. Now that you know what kind of pillow you’ll need, let’s find you the best down pillows for your needs! Whether you are a back, side, or stomach sleeper, we found great options to give you the support your body needs. We also found great options for budget shoppers and people looking to upgrade to luxury pillows. If you’re short on time, no worries! Start with our Top Pick and Budget Pick first, then come back when you have time! Our Top Pick for the best rated down pillows comes to use from Continental Bedding. This set of 2 Queen sized pillows is a great investment in your nightly sleep routine! These pillows are made of 100% white goose down, so they’re super soft without using lower quality feathers or filler materials to cut costs. We like that the 300-thread count covers are soft and stay cool, even on warm nights. Since they are on the soft side, they are great for people who sleep on their backs or stomachs. They provide plenty of support for your head and neck but allow your body to rest naturally for a better night’s sleep. If you prefer using a firmer pillow when you sleep, these also make a great option for filling decorative pillows or pillow shams that match your bedding! They also come in standard and king sizes, so you can buy whatever size fits your bed or your personal preferences! Next up are some cheap down pillows that are perfect for people who are allergic to traditional down fillers! 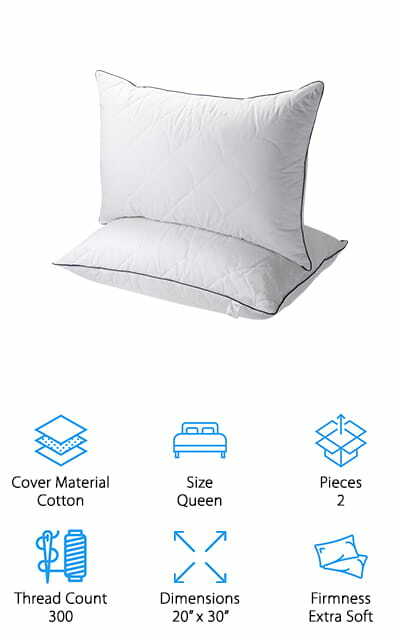 This set of 2 pillows from Sable is made of goose down alternative, which is great for people who want the feel of down but are allergic to birds. The cotton cover and filling are also treated with anti-bacterial and hypoallergenic properties to give you more protection from potential allergens. We also like that the cotton cover is thick and quilted, yet breathable to keep you cool during the night. In addition to being great for allergy-sufferers, these pillows are also easy to keep clean! You can machine wash your pillows, and then toss them into your tumble dryer! The soft pillows also have removable stuffing, making it easier to get the exact level of softness and comfort you need. Whether you want down pillows on a budget, or you can’t use down due to allergies, these are a great alternative! Looking for the best goose down pillows for side sleepers, consider picking up a set of these medium-firm pillows from Royal Hotel! 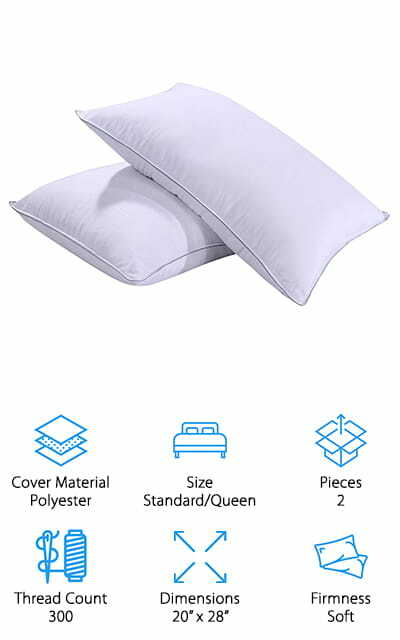 This set of 2 pillows has the firmness you need to keep your head and neck supported while you sleep on your side at night. To give your pillows the extra firmness they need, these pillows are filled with a mix of 75% down and 25% small feathers. The smaller feathers give you extra firmness that just down alone can’t accomplish. The 500 thread count cotton covers feel luxurious, just like in a fancy hotel! The thick cotton and wide stitching around the sides keep the down from poking out and keep you feeling cool and cozy on warm nights. They are between a standard and queen sized pillow, so they will fill either size pillowcase perfectly! These pillows are great for adding to a kid’s room, guest rooms, decorative pillows, and for tossing onto your own bed! For stomach sleepers, it’s important to have a pillow that feels soft but lies almost completely flat. This duck down pillow from Downlite is great for stomach sleepers who don’t want or need a lot of support at all! These standard size pillows are rated as “extra soft,” which means they’ll give you support if you need it, or lie flat if you don’t. The 250 thread count cotton cover is cooling and soft, and it comes in a pretty light blue color. The hypoallergenic duck down is soft and easy to fluff up after sleeping on it overnight. Oh, and this pillow is machine washable and dryable, too! This is great if you want to put them in a child’s room, or you just want to keep your own pillows super clean. If you’re a side sleeper, that’s cool! These pillows are thin enough to stuff in with your regular pillows if you need some extra support or cushioning! Next up in our goose and duck down pillows review is this set of 2 down pillows from East Coast Bedding! These pillows are a medium firmness, which is great for side sleepers, and many back sleepers will like them too. We also think they would make great decorative pillows because they are firm enough to stay standing up, but without investing the extra money in firm pillows. They are standard sized, but you can order them in queen and king sizes if you want to as well. The 100% cotton shell uses 300 thread count fabric to protect you from the down poking out while keeping you nice and cool. We like that each pillow is filled entirely with 22 oz. of white down, with no extra fillers or feathers. The down has been sterilized, so it’s suitable for people with mild allergies. If you use these with a high-quality pillow protector, these pillows should give you the support you need for years! On our hunt for the best feather and down pillows, we came across these luxurious and versatile pillows from Luxuredown. This king-sized pillow has a medium-firm level of stuffing, which is great for people who sleep on their backs or sides. It will hold its shape well all night, no matter what position you sleep in! The extra long size is perfect for people who toss and turn a lot when they sleep. Instead of dragging the pillow over to where you roll, it’s wide enough to toss and turn without slipping away from it! We like that the down and feather mix provides the softness of white goose down and the extra support from some smaller feathers. The cotton cover is 330 thread count fabric with a sateen finish, which feels silky smooth, just like luxury pillows you find in a hotel! These pillows also come in standard and queen sizes and are a great investment for better sleep! One thing we looked for in our goose down pillows review was a pillow set that would work for all kinds of sleeping positions – and this set from WENERSI is great for everyone! These pillows are made of 85% soft goose feathers and 15% goose down, which feel soft and cushy while adding extra support for side and back sleepers. Stomach sleepers will also like these pillows because they form well to your head, so you can lie as flat as you want! The cover is made of 100% cotton, with silver piping around the edge for a luxurious touch that also keeps the feathers from leaking out. The cover is also treated with an Ultra Fresh treatment, which protects you and your pillows from microbes, dust mites, and bacteria that can aggravate your allergies over time. These are also inexpensive, and they would make a great gift for a student going off to college, or a nice housewarming gift! If you want to ensure the down pillows you buy are ethically made, this set from Beckham Hotel Collection is a great option! The down and feathers is certified by Control Union to meet the criteria for their Responsible Down Standard (RDS). This means the ducks and geese are treated humanely and ethically. The pillows are also made in the United States, so if you want to support U.S.-made products, this is a great place to start. They are made with down, feathers, and down alternative to provide maximum comfort and support for all kinds of sleepers. The Egyptian cotton is 1,000 thread count fabric that prevents the feathers and down from leaking out, and they feel absolutely luxurious! The covers and stuffing are hypoallergenic and chemical free, and they are resistant to mold, dust mites, and other potential allergens. For allergy sufferer and ethically conscious consumers, these are a great option for adding a little luxury into your life! When looking for the best down pillows for back sleepers, we focused on finding softer pillows that still add good support for the neck and head. These pillows from AIKOFUL are a great set if you are most comfortable on your back at night! The down and feather mix in these pillows is on the softer side, which is perfect for back and stomach sleepers. It comes with 2 pillows, so if you switch to sleeping on your side occasionally, you can just double up on pillows for extra support! The down and feathers are hypoallergenic and have been cleaned several times to ensure they are safe for people with allergies. 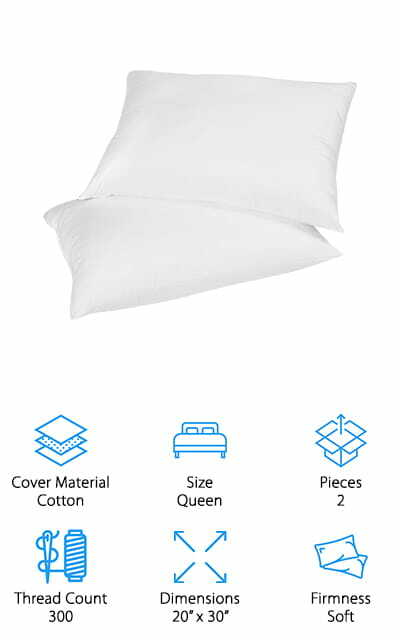 We also like that the cotton covers have been treated with Ultra-Fresh protection, which prevents mold, mildew, dust mites, and other allergens from invading your pillows – and helps prevent odors, too! They are also fairly inexpensive, so you can upgrade pillows for your whole family without breaking your budget! Last up in our down pillow buying guide is this set of pillows that is great for a child’s room or guest bedroom! These pillows from Homelike Moment are standard/queen size, so they fit into standard pillowcases, or stuff them into decorative shams for a luxurious look! 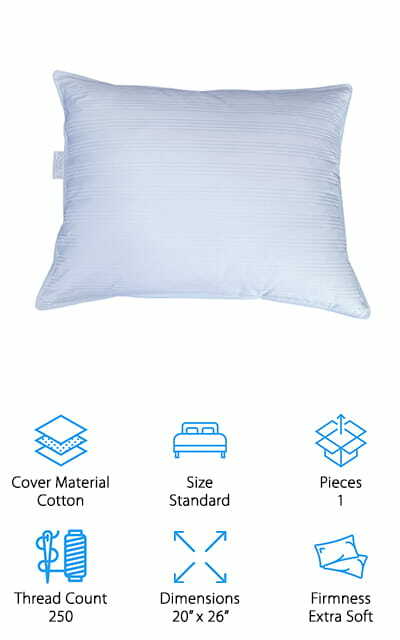 The pillows have inner stuffing made of feathers and down, and an outer layer made of microfiber polyester, to give you added comfort and coolness while sleeping. The cover is made of polyester fabric that’s smooth and soft, and the outer stitching is durable enough to keep the all of the feathers and stuffing intact. We like this fabric because it looks like a luxury hotel pillow and doesn’t make crinkly noises while you move around in bed! Another thing we really like about these pillows is that they are machine washable! That makes them perfect for putting in a child’s room, guest room, or anywhere you prefer to wash pillows more often!